Who should not take Olanzapine Vial? 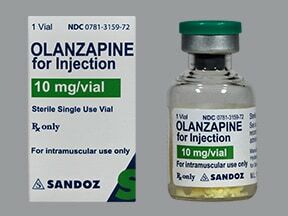 What conditions does Olanzapine Vial treat? Tell your doctor right away if you have any serious side effects, including: agitation, confusion, slow heartbeat, restlessness, weakness, numbness or tingling of hands or feet, tremor, yellowing of the eyes or skin, severe stomach/abdominal pain, difficulty swallowing, trouble urinating, interrupted breathing during sleep. List Olanzapine Vial side effects by likelihood and severity. Before using this medication, tell your doctor or pharmacist your medical history, especially of: liver problems, dementia, seizures, prostate problems, glaucoma (narrow angle type), intestinal disease, difficulty swallowing, smoking, low white blood cell count, personal or family history of diabetes, heart disease, high cholesterol/triglyceride levels, breathing trouble during sleep (sleep apnea). What should I know regarding pregnancy, nursing and administering Olanzapine Vial to children or the elderly? Does Olanzapine Vial interact with other medications? Not applicable. This medication is given in a hospital and will not be stored at home.Information last revised July 2017. Copyright(c) 2017 First Databank, Inc.
Are you taking Olanzapine Vial? 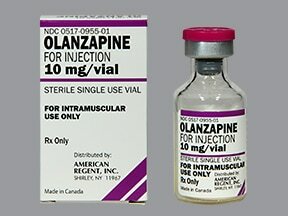 Are you considering switching to Olanzapine Vial? How long have you been taking Olanzapine Vial?